In May 2016, the Finnish Government published a Government resolution on State ownership policy. 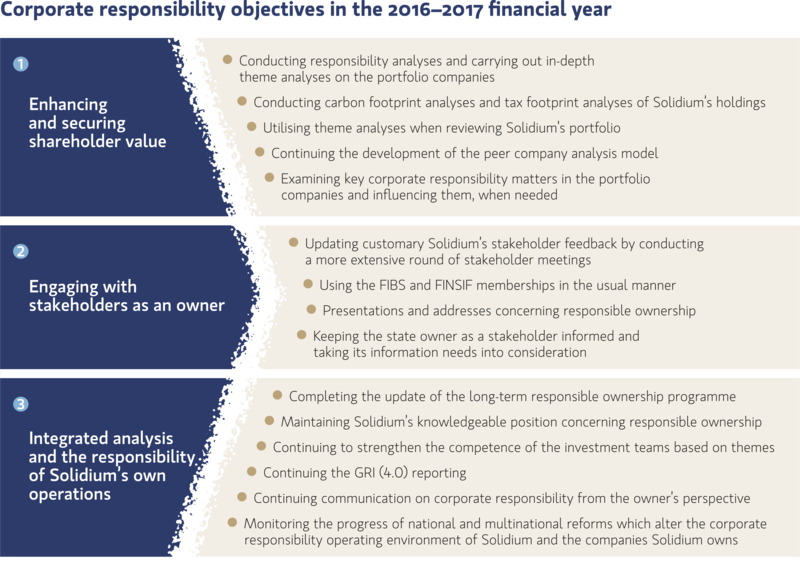 The “Making the balance sheet work” resolution will strengthen Solidium’s work as a responsible owner and provides guidelines for the development of corporate responsibility work. It highlights corporate social responsibility as the core value of State-owned companies and as part of improving competitiveness in the long term in the companies. The objective in the 2016–2017 financial year is to deploy the resolution in Solidium’s operations, including setting measurable corporate responsibility objectives for Solidium’s own operations as a responsible owner. We will monitor the progress of national and multinational reforms, which modify the corporate responsibility operating environment of Solidium and the companies Solidium owns. Complying with the stricter EU regulation concerning non-financial reporting is a central project. The international Sustainable Stock Exchange Initiative will also alter the operating environment of corporate responsibility. Agenda 2030 for Sustainable Development, or the SDG 17 objectives agreed by the UN member states, will impact the priorities of corporate responsibility work in our portfolio companies in the long term. We will continue to apply our responsibility analysis and will work to strengthen insightful ownership in corporate responsibility matters. We will examine and, when needed, influence material corporate responsibility matters in the companies we own. The theme-focus of our new responsibility analysis provides the investment teams with improved opportunities to deepen both their knowledge of company matters and their own competence. We will continue the development work in order to extend the systematic review of corporate responsibility matters to our portfolio companies’ peer companies as well.